An empty Hidden Animal Bowl, from French artist Geraldine De Beco for Bernardaud, is not much to look at; the base of bowl is scraggly and the interior is vaguely rippled. But pour liquid in and a silhouette of an animal appears, magic-like. 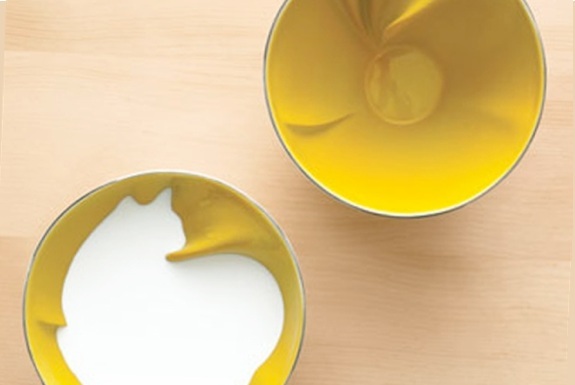 There are a variety of bright bowls colors and three animals to choose from: a bird, cat and wolf. Kids will love using these bowls. Parents won’t let kids anywhere near them once they see the price: €240 (US$330). Yes, that’s per bowl! Hidden Animal Tea Cups, by Canadian designer Ange-line Tetrault, each have a little animal sculpture (either a fox, bear or owl) attatched to the bottom of the interior. These cups aren’t as subtle at hiding their beasts as are Bernardaud’s bowls (above). But then they cost 1/15th the price. The maker of these teacups, imm Living, has several other household accoutrements that incorporate animals into their design, including a dove bottle opener, bird juicer and deer antler key holder. I’ve seen the hidden owl teacup before, but hadn’t seen the bear or fox – they’re so cute! !